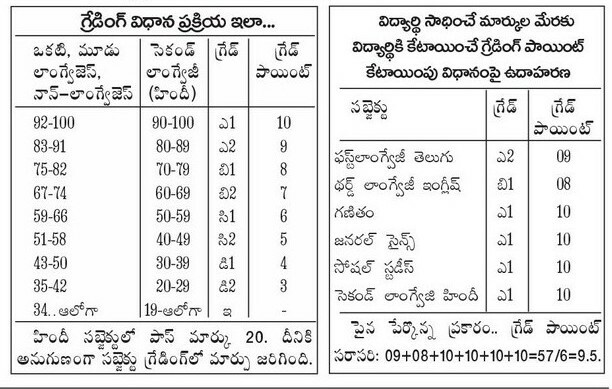 The AP SSC Results will be results will be released on 17th May 2013 around at 11am. The Results will be results will be released by Hon Min for Edn. The Board of Secondary Education is announcing Results only in Grading System. Students who scored better grades in all subjects will get better CPGA Points..Means Overall Performance in all subjects is taken into account in this system. Thus 60 is divided by 6 : ( 60/6) and results 10 Points . 60/6 = 10 Points = A1 Grade. If your Grade follows like A1+A2+A1+A1+A2+A1 in 6 subjects.Then your Grade Points calculation calculate as 10+9+10+10+9+10=58/6=9.66. Here your Grade Points=9.66.